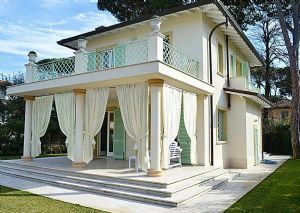 Single villa for rent (280 sqm) with 2000 sqm garden. 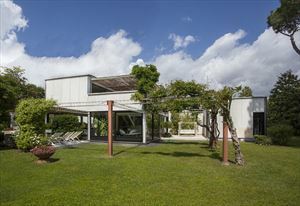 It is located in Forte dei Marmi (Vittoria Apuana area) at about 800 meters from the sea. 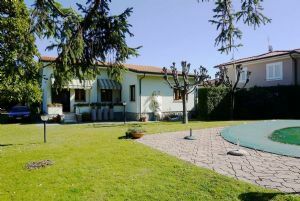 Single villa (280 sqm) with 2000 sqm garden. 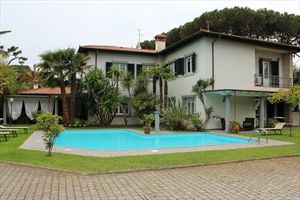 It is located in Forte dei Marmi (Vittoria Apuana area) at about 800 meters from the sea. 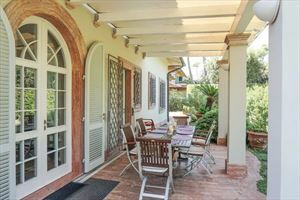 Real estate is equipped with air conditioning in the three bedrooms on first floor, alarm system, automatic gate, covered parking for two cars, wide patio with dining table and couches with cushions. 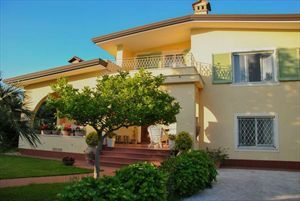 Ground floor - hall, lounge with fireplace, living room, kitchen, guest bathroom, bedroom and bathroom for personnel, laundry. 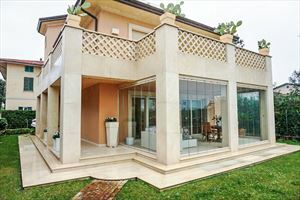 First floor - master room with bathroom, double bedroom with bathroom, two single bedrooms, shower bathroom, double bedroom, bathroom with tub. Basement - free space, utility room.